Our private Versailles Tours Include: Our private Versailles tours include private tour guide, tickets and reservations to Versailles palace, roundtrip door-to-door transportation, taxes, tolls and parking. 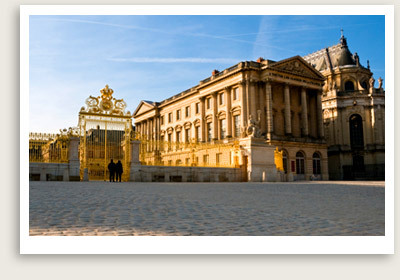 Tour Closings: The Palace of Versailles is closed for tours on Mondays and some holidays. Enjoy the Palace highlights of this Versailles tour as your tour guide takes you on a private tour of Versailles palace. In this Versailles tour, your tour guide will take you on a panoramic tour of the Grand Canal, the Grand Trianon, the Petit Trianon, and the Hamlet of the Queen Marie-Antoinette. French history will come alive as your guide tells you stories about Sun King and those who resided within the palace. In this guided Versailles tour, your Versailles tour guide will introduce you to the world of Louis XIV along with the history of the Palace of Versailles and the magnificent Gardens. On this Versailles private tour, you will discover the architecture of the Palace, the different courtyards, the Royal Stables and the magnificent gardens. This guided tour of the Palace of Versailles will take you to the Royal Apartments, the Royal Chapel, the Queen’s Apartments, and the Hall of Mirrors. This four-hour tour only provides a glimpse of Versailles’ elaborate gardens and groves. Full day tour is suggested.